Happy Thursday, all! Can anyone else believe that we are two weeks out from Thanksgiving? Sheesh – time sure does fly these days. Anyways, let’s jump right into things that have thrilled me throughout the week. The Thankful Tree with Chalk. My former boss back in Iowa sent this to me, and I think it is the cutest idea! What a fun tradition to start at Thanksgiving – maybe in the future when I start hosting the holidays. 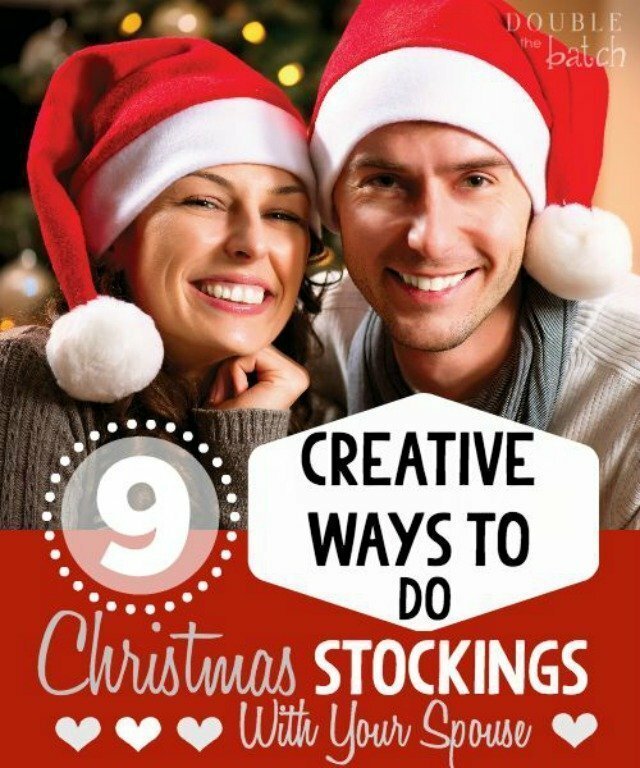 9 Creative Ways to do Christmas Stockings with Your Spouse. This is the first year that Ryan and I have stockings, so we’ve been brainstorming different themes or games that we can incorporate into buying the stocking stuffers. This is a great list of ideas. Chocolate Chip Cookie Dough Baked Oatmeal. I’ve been trying to find easy, relatively healthy recipes to start making for breakfast. I’ve never been a fan of oatmeal, but I know it is good for you – my dad has a bowl every morning. This particular recipe sounds pretty delicious and intriguing – it supposedly still has the nutritional benefits of oatmeal but tastes like a cookie. I can get behind that. 6 Tips You Need Before Considering a Long Bob. I continue to go back and forth (span style=”font-size: x-small; pretty much on a daily basis – poor Ryan) on whether or not I should cut a few additional inches off my hair into a fresh, shorter – but not too short – lob. However, this article is making me take a hard look at whether or not I would be happy with the cut in the long run. Golden Smokey Eyeshadow Tutorial. This is a perfect eye look for the upcoming holiday season and easily can work with any eye color. 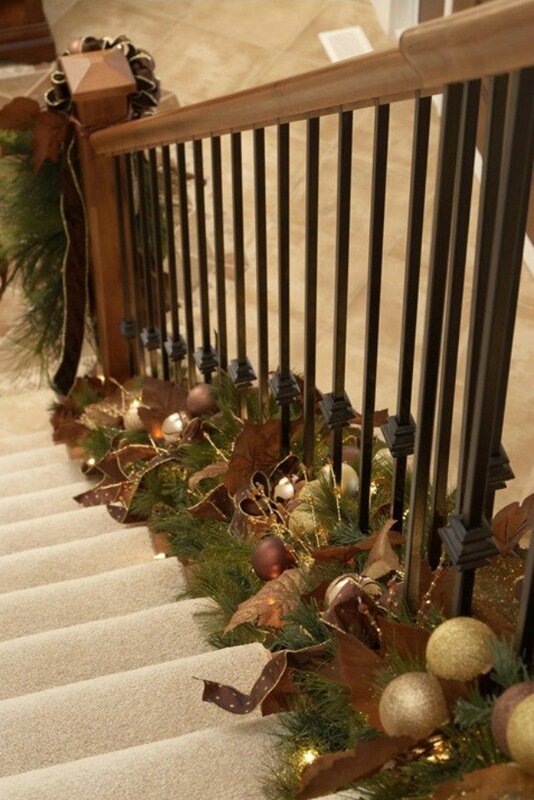 Holiday Decor Twist: Garland at the Bottom of Stair Railings. It’s when I see things like this that I kick myself for not thinking of it earlier. How genius to put the garland at the bottom of the stair railing instead of the top so the top of the railing is still functional?! Mind blown. Christmas Magic Cookie Bars. Since I won’t have nearly as much time this year for holiday baking, nor will my new kitchen be fully set up and functional, I’ve been keeping an eye out for relatively easy recipes that I can throw together without a lot of ingredients or tools. This one seems to fit that criteria, and it looks absolutely delish! Kate Hudson at the 2014 LACMA Art and Film Gala. Although this event occurred last week, I simply cannot get enough of Kate in this look – I mean, it’s perfection. For my cousin’s wedding next year, all us bridesmaids are wearing blush-toned dresses and I’ve been struggling to figure out how to do my makeup so I don’t look washed out. Well, thanks to Kate and her makeup artist, I now have great inspiration! 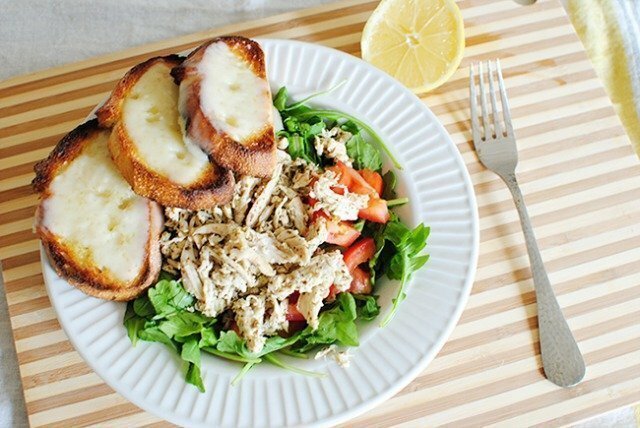 Arugula and Pesto Chicken Salad with Provolone Crostini. It’s always refreshing to come across a healthy meal this time of year. I’ll be picking up the ingredients for this one next time I’m at the grocery store. Cranberry Brie Bites. Clearly, I’m into food and desserts this week. These would be perfect as an appetizer for Thanksgiving or Christmas. They even look fancy but don’t require a ton of work. That’s a win-win in my book! You are too sweet! I think we are going to be fast friends. I would love to hear your thoughts/experience with the bob – I'm still on the fence about it! I don't want to go as short as Taylor Swift or anything, though, so maybe I would still be OK with it. Ah, the seriousness and dilemmas of haircuts. Right?! It never occurred to me to have a stocking theme – that makes buying things so much easier! All of those desserts are making me so hungry! Those Christmas bars are so festive and probably so good! I'm going to check out that stocking stuffer link- such a good idea! That's a great idea for avocado toast – it sounds delicious and healthy! I definitely don't want to cut my hair as short at T. Swift's – just a bit shorter in general. I always feel like I look the same, so I'm in the market for a change. And yes, hair always grows back like you said. 🙂 Hope you found the stocking article useful! I've never tried that kind of oatmeal – I will keep an eye out for it! Like I said, I've never been much of an oatmeal person, but if it tastes like a cookie, I'm all over it. Kate Hudson did look stunning in that dress. Happy Thursday! I knew you would enjoy that! That's next up on my grocery list, too – it looks delicious! I'm so glad that you enjoy these posts! Kate Hudson did look perfect in that dress – I can't get enough of it either! I need to try that oatmeal asap! 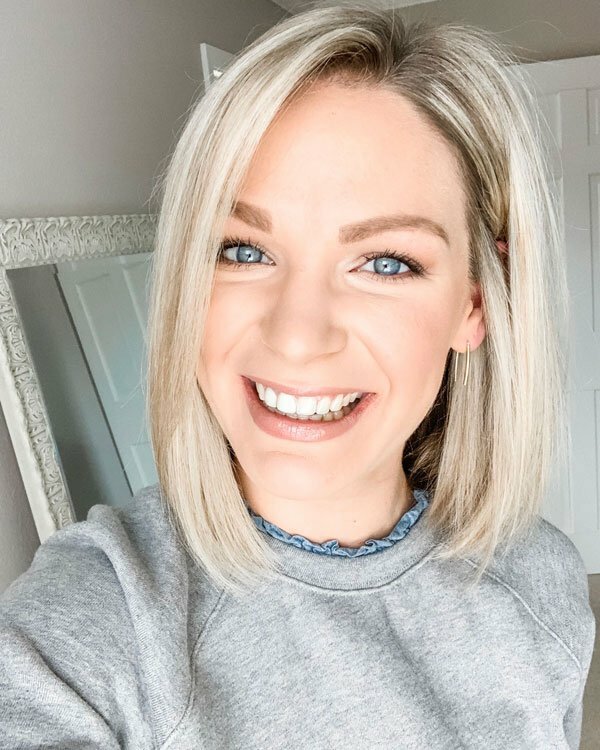 I know – the lob seems to be the hot haircut of the moment! The only problem with looking at it on celebrities is that they have millions of dollars to have someone do it for them, lol! I can't wait to try out that golden smokey eye. If you like avocado, I've been loving spreading it on toast with a little bit of salt and pepper for breakfast. It gives me the same taste as having eggs for breakfast (I'm not a sweets in the morning type person) and it keeps me full way longer than cereal or oatmeal. I'm also loving gold/bronze eyes right now too, a little festive and a little smokey! I love that golden eye look and Kate Hudson is stunning in that outfit. I think her makeup is perfect too! I totally agree it's easy to look washed out in blush colors, but that is the way to do it. Feel free to send me some of those Christmas bars 🙂 They look yummy! I think you should totally go with the long bob!! Loving the Taylor inspiration picture. And of course, it's hair so it will grow back! At least that's what I always tell myself 😉 Off to check off the stocking article! Love that eye makeup look, those brie bites look yummy and would be great for a holiday app. My mom gave me some holiday floral and berries yesterday for me to make something. The garland idea is good. FYI use fake garland, the real stuff gets everywhere. Hope that you are having a good day and staying warm today!!! 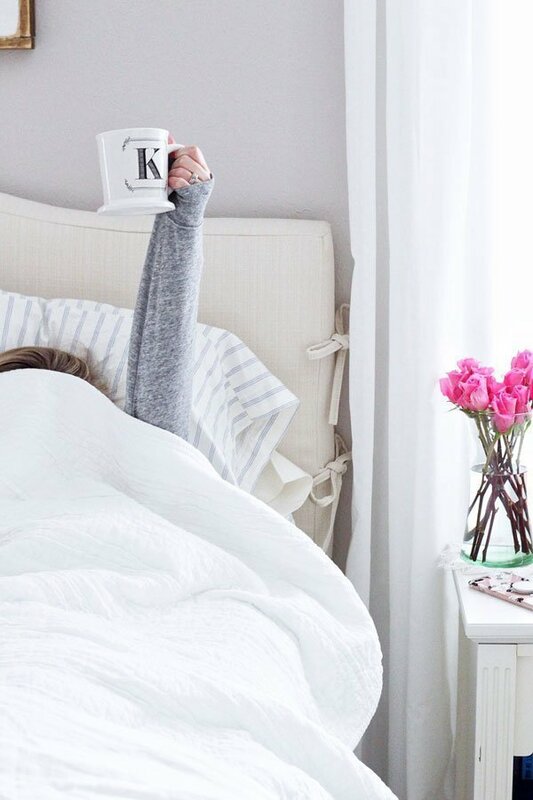 Lots of great recipes, decorating tips and beauty finds this week! I'm really liking that Christmas garland idea for the staircase! That oatmeal sounds so good! Bookmarking the pesto chicken salad to make soon! 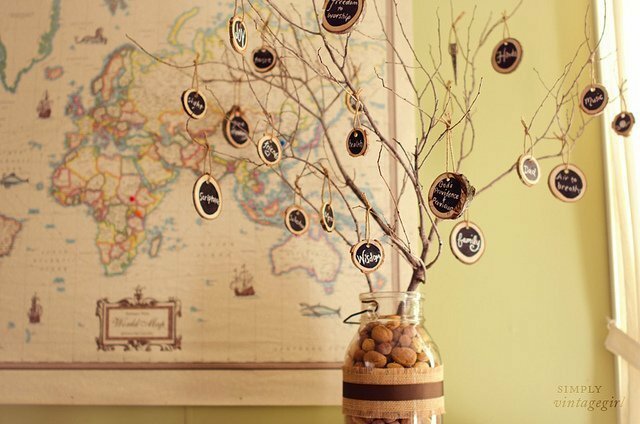 I love that chalkboard tree, that would be a great DIY. Oatmeal that tastes like a cookie, you can't beat that. So many great sounding dishes this week! I'm so glad you're doing these posts – I get so much inspiration from them!! I am still loving Kate Hudson's look – it was perfect!! 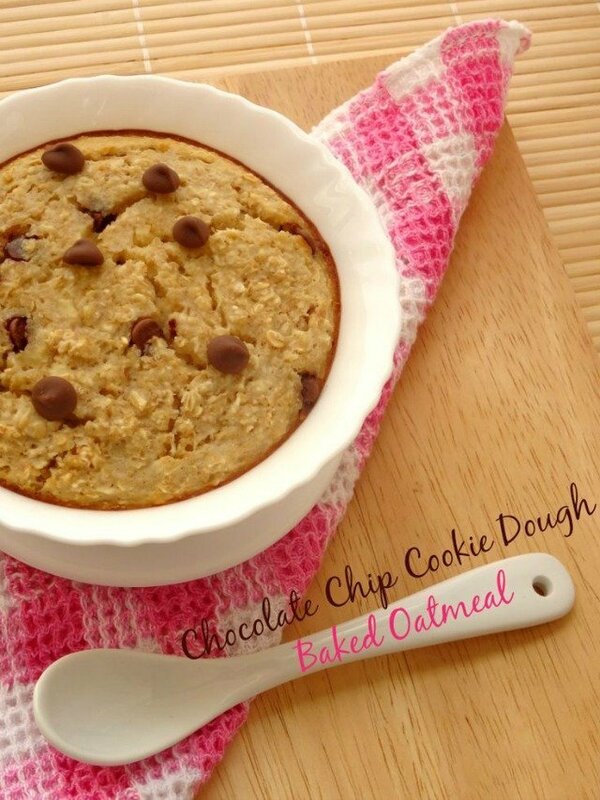 I'm drooling over the Chocolate Chip Cookie Dough Baked Oatmeal….YUM!!! I definitely need to read the long bob article since I continue to go back and forth about it as well! So many celebs are rocking it and it looks SO good on them! That golden smokey eye is so pretty, perfect for the holidays!